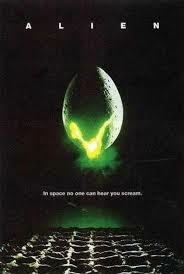 I was 16 years old when this movie came out and far too cool to be showing how scared I was, but the three people that went with me are just waiting in the wings for the E! Hollywood True Story to tell all my business, so I’ll go ahead and tell it here. Alien scared the bajesus outta me! The only predictable thing in the film for me was the order in which everybody was going to die. Even as a sixteen year old, I understood how Hollywood economics worked and since John Hurt was the most famous actor on the payroll of this film…I knew he’d get it first! I just had no idea how spectacularly he’d get it. 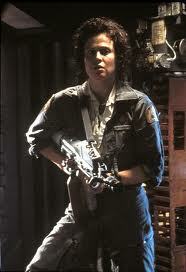 All the way down to the sole survivor (SPOILERS), this unknown actress named with the weird first name – Sigourney. When they removed that helmet and we saw for the first time the thing on Kane’s faced…it was a defining moment in horror cinema. At last we were being shown a new kind of monster and along with it a new set of rules we didn’t know. Most of our monsters had come from literary antecedents like Frankenstein or Dracula or The Hunchback of Notre Dame or Dr. Jekyll and Mr. Hyde or The Phantom of the Opera or the giant squid in 20,000 Leagues Under the Sea or a plethora of mythological antecedents like the Minotaur or the Kracken or Medusa from Ovid’s Metamorphosis or Scylla and the Cyclops from The Odyssey or Fenris from Norse mythology or the Balrog with its flaming whip and flaming sword from The Lord of the Rings first published in 1954. My favorite up until the Xenomorphs of Alien had to be Grendel from the epic poem Beowulf. Maybe not as horrifying on the surface, but equally monstrous is the Jabberwock from the poem “The Jabberwocky” by Lewis Carroll who through the use of nonsense language creates a monster so horrific it defies imagining because we humans fear what we cannot conceive…which brings us back to Alien. 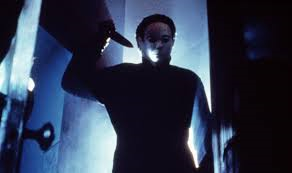 Yes, Halloween gave us Michael Myers a year before we got Xenomorphs from Ridley Scott, but the fact that Meyers was human (if not a psychopath) rooted us in understanding of what to expect. Screenwriter Dan O’Bannon did NOT give us something so relatable. He and Ronald Shushett came up with something quite different and special thanks to Swiss surrealist H.R. 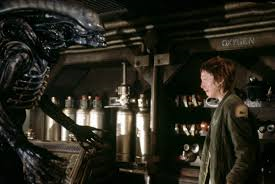 Giger for his alien design and Mr. Scott for his artistic vision…we now have a monster that has been the villain in a 6-film franchise (counting the Alien/Predator crossover films and Prometheus). One aspect of why this monster is so frightening is that it transforms in stages like a tadpole. From an egg to a parasite to a creepy crawly thing to a huge creature with acid for blood and a set of double mandibles with razor sharp teeth… we’re left wondering what else may come…and that is a vulnerable situation for the characters as well as the viewers. In other words, it’s a recipe for awesome story telling. Even by the end of the film we know pretty much nothing about this monster except it’s a killing machine with a predatory nature and instinct to survive. 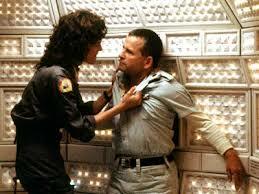 Little did he know that Ripley’s same instinct to survive would trump his own! 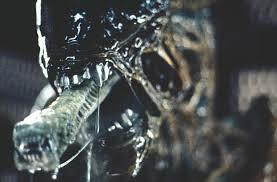 Why Xenomorphs scared us so much in 1972.